When I was pregnant with twins, I knew I wanted to breastfeed them but I wasn’t sure how it would work logistically. Where would all those limbs go? How would I hold them? Keep them still? Burp them? What about when one needs a diaper change and the other wants to eat? I knew there would be help in the hospital, but once I took my bundles home, what would I do all alone with them? And is breastfeeding twins unassisted even possible? If you’re expecting twins or just recently brought home a pair of squirming babes, you might be feeling a tad…overwhelmed. The first thing I want to say to you is, take heart! You can do it! Breastfeeding will get easier, and you’ll all learn as your little ones grow and change. Don’t give up now. The second thing I want to say to you is that there is no “one-size-fits-all” approach. Just because your lactation consultant loves the football hold doesn’t mean you have to. And just because your friend who has twins recommends pumping and bottle feeding doesn’t mean that’s what you should do. You will find the system/approach/position that works best for you and your little ones. 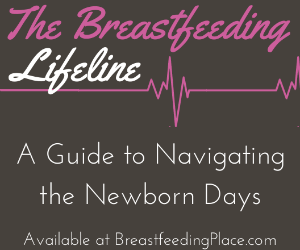 I highly recommend reading breastfeeding books by La Leche League prior to giving birth. Or even better yet, join a multiples group with La Leche. This book provides descriptions and photos of different breastfeeding positions for twins. A group of other mothers of multiples will provide a wealth of encouragement and advice. Also, take advantage of the hospital’s lactation consultant or your midwife’s expertise soon after giving birth. Have her help you find a position or two that are comfortable for you. As your little ones grow, you may experiment with new positions. Some mothers have the benefit of a husband or other family member who shares nighttime feeding responsibilities, but other mothers are on their own. (See more tips on breastfeeding twins.) For moms of multiples, the awkwardness of feeding two at once can become a jumble of arms, legs, wails, and squirting milk. I was advised from the start to always feed my twins together, especially at nighttime. In theory, it made sense: limit my waking time and get the two of them on the same schedule. So, I tried. But I found what sounded good in theory didn’t work in practice for me. My boys’ needs were so distinct from each other. One could sleep far longer and deeper than the other, so there was no sense waking him for four nighttime feedings when he could thrive with just two. One had medical complications and was hooked up to various machinery day and night for months, so maneuvering with all his cords and alarms on the rocking chair was enough for me to handle without adding another baby into the mix. And when one was finished eating, I never seemed to figure out how to lift him to my shoulder for burping without detaching the other. Maybe you will figure out a system that works great for tandem feeding, but for me we did nighttime feedings individually. During the day, I usually fed one at a time just because I liked the one-on-one snuggle time. But at other times, we were in a hurry to get out the door, or I needed them to eat quickly in the car at a rest stop or in a dressing room at the mall. In these instances, I would feed them together in the cradle hold. I also fed them simultaneously if they both woke in the morning at the same time. By this time my husband was gone for the day, so I wasn’t worried about waking him, and we were all too tired to get up for the day yet. We would often do a side-lying position in bed and then all drift off together for an extra 45 minutes of sleep before rising for the day. 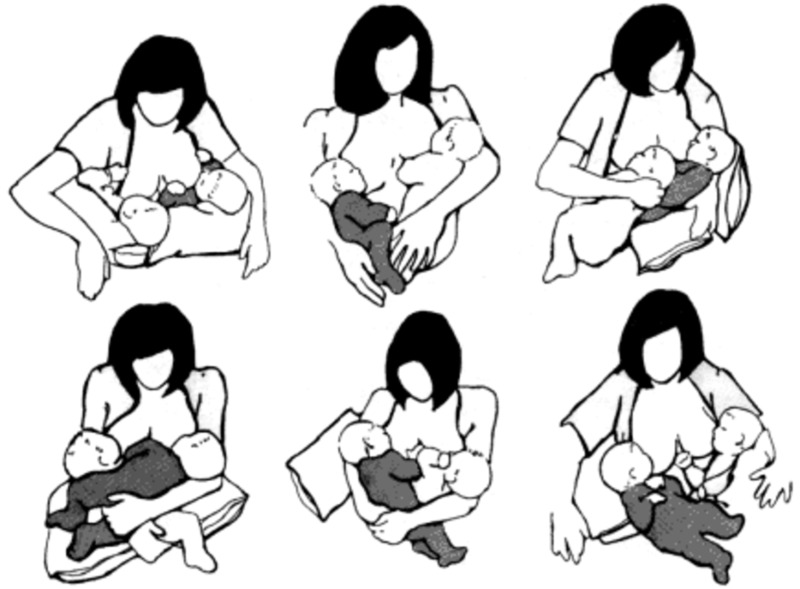 Here are some examples of positions for breastfeeding twins. Is Breastfeeding Twins Unassisted Worth It? You might be wondering if this all sounds too complicated – if it’s worth the effort. It is!!! I was so sad to finally wean my twins. We all loved breastfeeding. In the busyness of raising two at once, the special cuddle time of breastfeeding skin-to-skin can’t be imitated or replaced by any other activity. Like learning to drive, what seems difficult, overwhelming, and complicated eventually becomes second nature. Find your “bread and butter” position and then experiment with new ones. Eventually you will find yourself in the position of offering advice to other twin moms and encouraging them in breastfeeding twins unassisted! What position works best for you for breastfeeding twins unassisted? Great thoughts and information…..I tandem fed for 12 months in the football hold after i tried every combination this is what worked for me and we were able to stick with. This helped my boys stay on the same schedule and helped keep me off the couch ALL day long. The best advice I can offer any new mom is dont give up! It is worth it in the long run and will get easier and benefit everyone. Even though my twins were my 4th and 5th children learning to nurse them was much different than my other children, it was all new. Michelle, Thanks for your thoughts. I love to hear success stories from other breastfeeding MOMs! I also used the football pose. When one daughter woke up, I woke the other girl up and always fed them at the same time. At the time, life seemed really difficult. Seven years later, I look back at that time with such a sense of peace and beauty. Helen, Glad you found something that worked for you. Everything seems easier in retrospect…I guess that’s a good thing to keep in mind for all of parenting! Hi there! And congratulations! 🙂 Don’t worry about attempting tandem feeding right out of the gate if you don’t want to. You can just enjoy and get to know your new little ones. As you get more comfortable, you can hone the skill of tandem feeding. 🙂 Don’t feel any pressure! 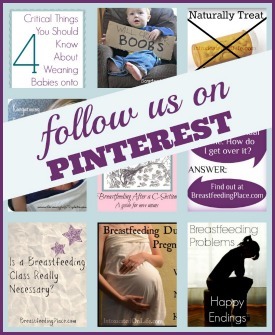 The goal is just to enjoy breastfeeding your little ones! It took me a while to get the hang of tandem feeding two of my triplets. Eventually, I got it down and it really did make the feedings go a lot more smoothly, like Lael indicates in this post. 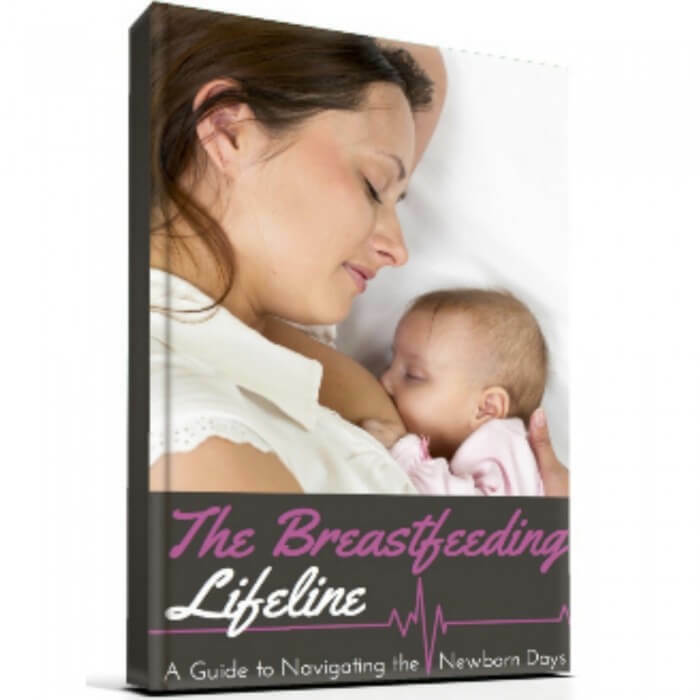 If you’re looking for more reading and info ;), check out Breastfeeding Place’s new book: The Breastfeeding Lifeline (aff link). My chapter on breastfeeding multiples is at the end (there’s also a lot of resources/articles under the tab “multiples” at the top of the page. Finally, don’t forget to join our convos over on Facebook – we’ll see you there, friend! Man, it’s a challenge but so worth it. I’m attempting to breastfeeding my twin boys. They’re 7 weeks now and it’s certainly an accomplishment if you have breastfed multiples for any amount if time. I keep waiting for it to get easier, and I will keep at it because I know how beneficial it is for all of us. We had a hard time getting going because on of my boys was in the NICU for a while and I wasn’t able to breastfeed him during his stay so he had some catching up to do. The logistics of it all is quite a circus, plus we have to supplement with formula because my supply is low. I live a life of “ings” as I’m sure you all do too. Diapering, feeding, burping, cuddling,swaddling, and repeating. A labor of love and I wouldn’t trade it for anything. Thank you for sharing your story with breastfeeding twins! I am 20 weeks along, expecting twin boys, and really hope to breastfeed them together. I have a question for all you other moms of twins, would you recommend using a twin nursing pillow? They seem pretty expensive so I was hoping to make do with just a stack of regular pillows around me. But for the sake of making tandem breastfeeding easier, should I get one? Any thoughts?